As the saying goes, “If momma ain’t happy, ain’t nobody happy.” As women, God has given us a huge amount of influence over our families. How are you using that influence today? We are each uniquely gifted to care for our families and today I want to share some practical ways that mothers can use their influence for good and be a blessing to those that they love the most. 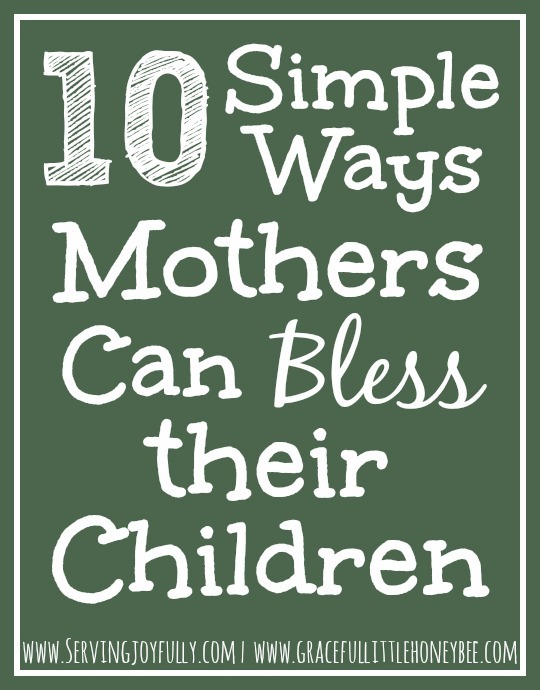 So join me over at Serving Joyfully to see 10 Simple Ways that Mothers Can Bless Their Children and be sure to comment and let her know that I sent you! Merry Christmas! I found you through Titus 2 Tuesday and can't wait to hop on over and read your post, but I wanted to follow you first. Your blog is adorable and as a blogger about similar content, we have a lot in common! :) Such a blessing to connect with you! Hi Sarah Ann! I'm so glad that you dropped by and introduced yourself. I will have to check your blog out! Have a great day!